I was meeting a new friend for lunch. We were actually meeting for the first time- it was one of those mutual friends saying “you both live in the same city and would like each other- let me introduce you” set ups- and I ordered a salad. She shot me one of those quirked eyebrow looks across the table as if to say, “are you THAT sort of girl, one of those pick-at-a-salad-and-declare-yourself-stuffed females?” I quickly reassured her that it was actually a lettuce vehicle for bacon, blue cheese, chicken, hard-cooked egg. In other words, a Cobb Salad. Or maybe it was a Prawn Louie with avocado, grilled prawns, and Thousand Island. Either way, it was a salad you could sink you teeth into. 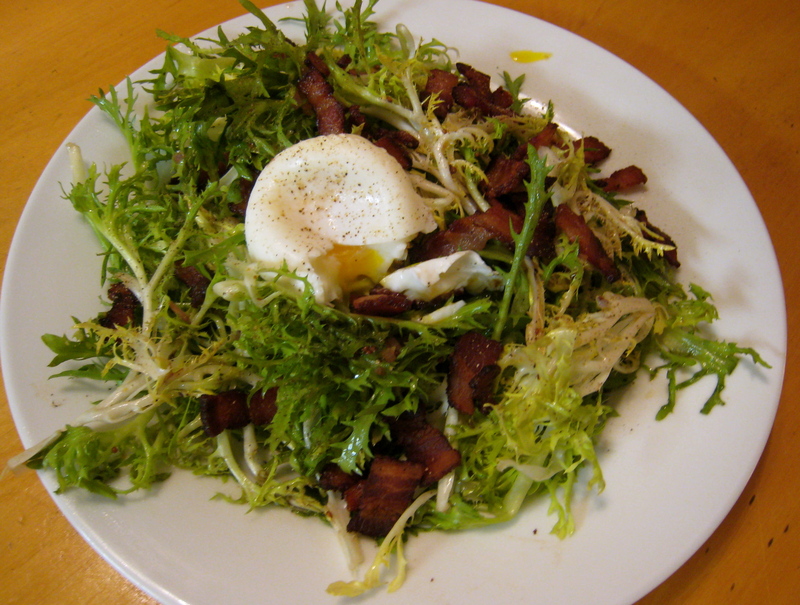 There is no sense of deprivation or denial with this Salad Lyonnaise, or salad frisée aux lardon. It provides all of the elements of “the perfect bite”- crunchy, salty, bitter, tangy, rich. I was inspired to try it at home by Simon Hopkinson’s Roast Chicken and Other Stories, one of my favorite cookbooks, loved as much for it’s narratives as for the actual recipes. I combined the basic recipe found in this book with some other classic ingredients in the dressing, mustard and shallots. -Fill a shallow saucepan with water and a generous splash of white vinegar and bring it to a gentle simmer. The bubbles should just be barely shimmering. One at a time, crack the eggs into a small bowl, then gently slip them into the water. Use a spoon to try to maintain the shape of the egg, but don’t worry if some of the white drifts off. You just want most of the egg to congeal together. Cook until the whites are set, for between 3-5 minutes. With a slotted spoon, scoop the eggs out of the water and drain on a paper towel while you finish the rest of the salad. -While the water is heating for the eggs, begin to fry the bacon in a skillet. Once the bacon is brown and crisp, remove it from the pan, leaving the rendered fat in the skillet. 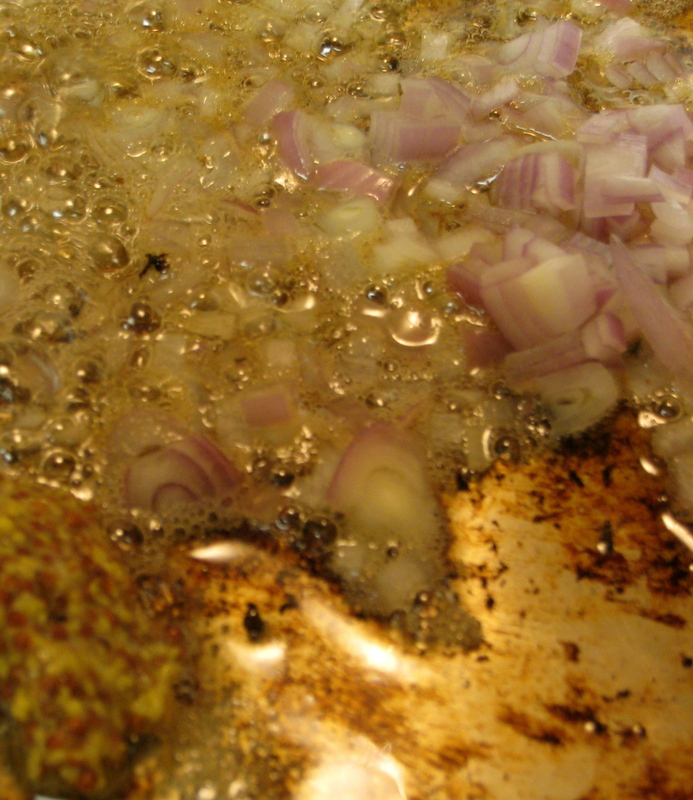 Stir in the shallots for about a minute. Take the pan off the heat and stir in the mustard and 3 tablespoons of vinegar, whisking well to make a creamy dressing. 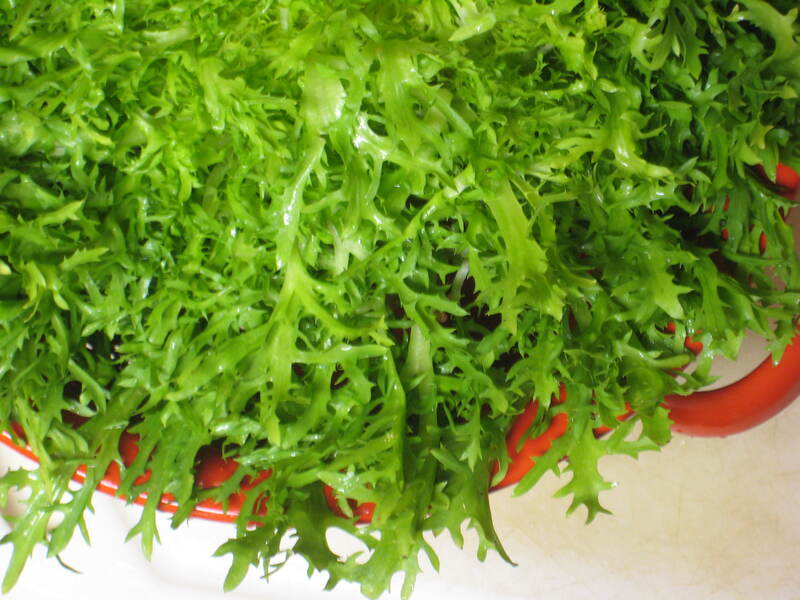 – Toss the frisée in the dressing, then season with salt and pepper if desired. Divide the salad greens between 4 plates, sprinkle each with bacon and gently nestle a poached egg on the top of each. Grind a little pepper over the top. – Optional: to add croutons, heat a little olive oil in a small skillet and fry the slices of baguette until golden brown and crisp on each side. Sprinkle with salt. 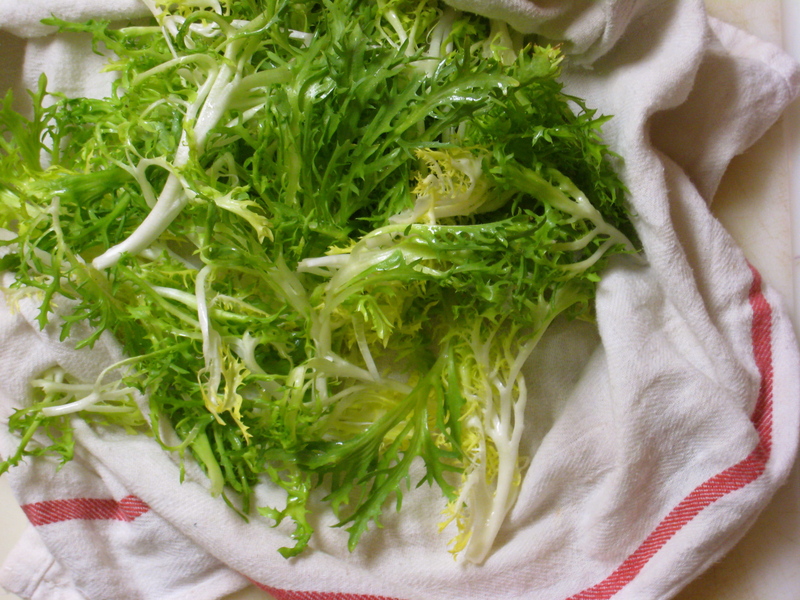 Frisée is also known as curly endive, a part of the chicory family. It has a distinctive pleasantly bitter taste. If you like arugula, give this lovely lettuce a try. It provides a lovely contrast to the other flavor components of this dish.